Seville is located in southern Spain and this city of almost 2,000 years old is characterised by narrow alleys, fairy-tale-like parks, historic buildings, has Arab influences and has a long river that runs through the city. The atmosphere is extremely hospitable, friendly and casual. Below you can read the best tips for a super day trip from the B&B. It takes a total of one hour to drive. Our advice is to park the car for free at the Condequinto metro station. Via the walkway over the motorway you can buy your metro ticket at the machine. From there it’s another 20 minutes by metro and you arrive right in the heart of Seville (the stop is called Puerta Jerez). All without traffic jams and time-consuming searching on a map. Ideal! We know a number of non-tourist addresses where you can experience an authentic blistering Flamenco show. Most shows are in the evening but we can also recommend a small theatre that often has afternoon shows on its programme. You can then come back and enjoy dinner at our B&B in the evening. Do you like remarkable buildings and colourful architecture? Then you have to visit Real Alcázar in Seville, a Moorish palace built in 913. It is still the residence of the king of Spain when he visits Seville. The gardens and palace are huge. Book your tickets online directly so you can skip the queue. Real Alcazar Sevilla book online tickets. 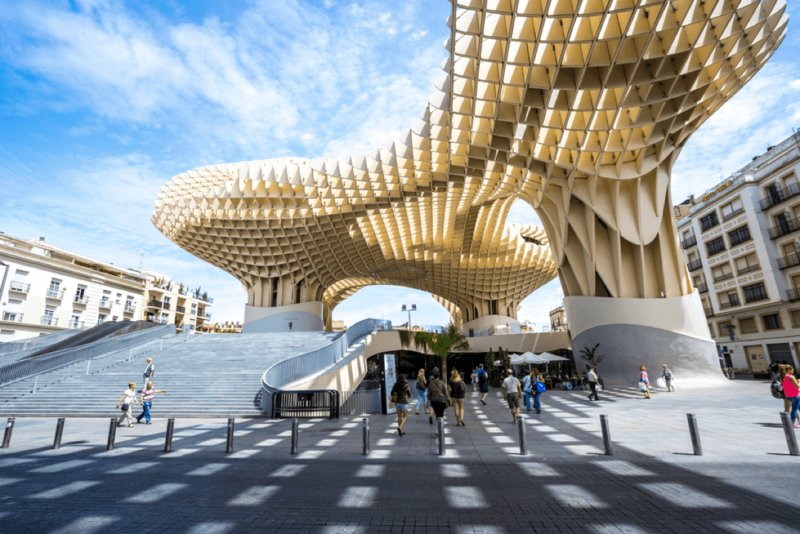 Go for a walk on top of the Metropool Parasol (see photo), the largest modern wooden building in Europe. You can buy your ticket in the cellar and for a few euros more can do this tour with 3D glasses from PastView (takes half an hour). This shows how Seville used to be in the past and during Expo’92. Really interesting! Marvel at the beautiful immense cathedral where you can also find the grave of Columbus. With your entrance ticket you can also climb the Torre La Giralda and visit the Basilica of El Salvador for the same price. Buy your ticket online at Cathedral Seville tickets or buy it in Seville at the Basilica of El Salvador so you don’t have to wait in the line. 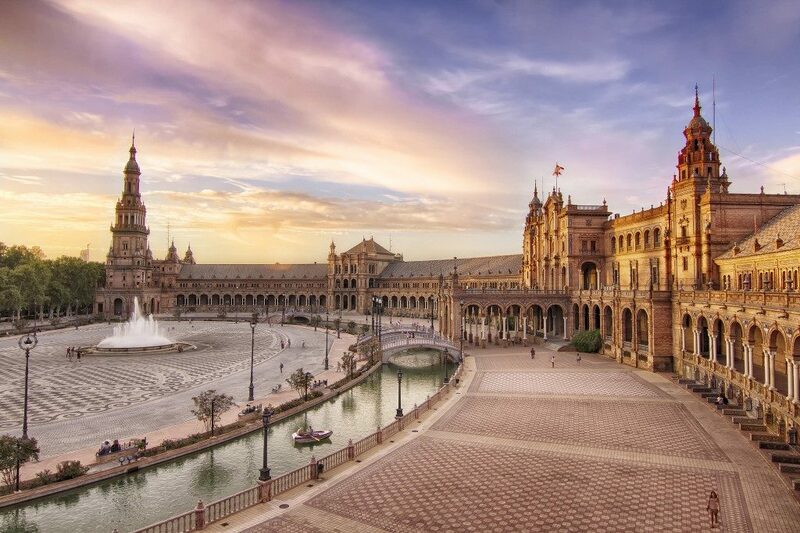 One of the most beautiful sights of Seville is the halve-moon-shaped square Plaza de España. A romantic place that is immediately recognisable by the many pillars, boats and colourful bridges. Next to the Plaza de España you will find a lovely park. Parque de María Luisa is perhaps known as the most famous park in Seville. Not so long ago this park was declared cultural heritage. If you want to discover Seville as a local, book your walk or bike ride with an English speaking guide. Piatours is highly recommended! If you would like some background information on Flamenco dancing, ask us for that address in Seville where you can see an authentic Flamenco show with a half hour English explanation. Every Thursday morning there is a lovely antique market in Calle Feria. In the square Plaza Alameda de Hercules you can eat delicious tapas in between the locals. It’s the largest square and has a bohemian appearance. Don’t forget to stroll through the old quarter of Santa Cruz, the neighbourhood with small streets, narrow alleys and squares. Go to this English website about Seville for more top tips. On the terrain of the B&B are a number of horses kept for breeding and close by is Santiago's riding school. He has a number of beautiful, well-groomed horses and can take you on one of his many beautiful routes. He knows the area and his horses like the back of his hand.